She sank in the snow up to her knees. 彼女はひざまで雪に埋まった. He sank under the waves. 彼は波の下に沈んだ. The sun was slowly sinking in the west. 日がゆっくり西に沈むところだった. The sun sank behind the mountain. 太陽が山の陰に沈んだ. A portion of the road suddenly sank in. 道路の一部が突然陥没した. The house has sunk about ten centimeters. 家(の土台)が約 10 センチ沈下した. Her eyes [cheeks] have sunk (in). 彼女の目がくぼんだ[ほおがこけた]. This land sinks gradually to [toward] the lake. この土地は湖のほうにゆるやかに傾斜している. His head sank forward on his breast. 彼はがっくりとうなだれた. sink to one's knees がくっとひざをつく. He sank to the ground. 彼はくずれるように地面に倒れた. She sank into his arms. 彼女は彼の腕に身を投げかけた. sink back into a chair (疲れて)身を投げかけるようにいすに座る; (気持ちよさそうに)深々といすに腰かける. The flood water is sinking. 洪水がひき始めている. The wind [flames] eventually sank down. 風[火炎]がやっとおさまった. His voice sank to a whisper. 彼の声は低くなってささやきになった. The fire sank to embers. 火が弱まって残り火になった. The dollar is sinking. ドル(の価値)が下がっている. The shares sank to a quarter of their value. その株は暴落して価値が 4 分の 1 になった. Unemployment has sunk from 12.3 to 10.9 percent. 失業率は 12.3 から 10.9 パーセントに減少した. He sank in the opinion of his girlfriends. 彼はガールフレンドたちの間で評判を落とした 《男を下げた》. The patient was sinking fast. 患者は急速に衰弱していった. She began to sink under the burden of her worries. 彼女は心配事の重荷に憔悴(しようすい)し始めた. My heart sank (within me) at the news. そのニュースに私は気がめいった[がっかりした]. His courage [heart, spirits] sank (into his boots). 彼はがっかりした[意気消沈した, 気がめいった]. He sank into (a) sleep [reverie]. 彼は眠りに陥った[夢想にふけった]. sink into poverty 貧困に陥る, 零落する. The company sank deeper into the red. 会社はますます赤字になった. This dye sinks in well. この染料はしみ込みがいい. Water sinks through sand. 水は砂にしみ込む. The ink soon sank into the blotting paper. インクはすぐ吸い取り紙に吸い取られた. The idea took a long time to sink in. その考えが理解されるまでには長い時間がかかった. The words sank slowly into his dull brain. その言葉がゆっくりと彼の鈍い頭に浸透していった. The submarine sank an enemy ship. その潜水艦は敵艦を 1 隻撃沈した. sink a pile (ten meters deep) into the ground くいを地中に(10 メートルの深さまで)打ち込む. sink one's teeth into an apple がぶりとリンゴにかぶりつく. sink letters into a stone 石に文字を刻む. He sank his head on his chest. 彼は頭をたれた[うなだれた]. sink a bucket into a well 井戸の中へバケツを下ろす. She sank her voice to a whisper. 彼女は声を低くしてささやいた. That will sink you in her estimation. そんなことをすると彼女の評価が下がるぞ. The difficulties would have sunk a rasher man. あの苦難ではもっと向こう見ずな人だったら身を滅ぼしていただろう. He has sunk a lot of money in [into] the unfortunate undertaking. 彼は多額の金をその不運に終わった事業に投資してしまった. sink one's own interests 自己の利益を捨て(て人の利益を図)る. We sank our differences. 我々は意見の相違は度外視した. 〔+目的語+in+(代)名詞〕[sink oneself で] 〔思いなどに〕ふける; 〔絶望などに〕陥る 《★また過去分詞で形容詞的に用いる; ⇒sunk 3》. He sank himself in thought [his work]. 彼は思いにふけった[仕事に没頭した]. a stainless steel sink ステンレスの流し台. a sink of iniquity 悪の巣窟(そうくつ). Several ships sank in the storm. The box didn't sink immediately; it floated for a little. The moon was sinking behind the mountains. The stone building sank about half an inch in three years. The ground sinks a little from here to the beach. Her eyes have sunk in. The wind has suddenly sunk down. Prices sank to an unprecedented low level. The patient was sinking fast in the heat of summer. Her heart sank when she saw those unpaid bills. He sank into an armchair. I sank to my knees. The rain rapidly sank into the sandy soil. The moral of the story sank deep into my mind. They used torpedoes to sink the battleship. He looked around and sank his voice to a whisper. I was sunk in misery. I'm afraid drinking will sink him. Ask him to sink the fence posts deeper. He sank every cent he had into his business. Why don't you leave your son to sink or swim by himself? My husband was washing dishes in the sink. A device or part of a device that receives something from another device. From 古期英語 sincan, from Proto-Germanic *sinkwaną, from Proto-Indo-European *sengʷ- (“to fall, sink”). Compare West Frisian sinke, Low German sinken, Dutch zinken, German sinken, Danish and Norwegian Bokmål synke, Swedish sjunka. (heading, physical) To move or be moved into something. (ergative) To descend or submerge (または to cause to do so) into a liquid or similar substance. A stone sinks in water. The sun gradually sank in the west. (transitive) To cause a vessel to sink, generally by making it no longer watertight. (transitive) To push (something) into something. Before installing the new surfacing material, sink any protruding nails. The joint will hold tighter if you sink a wood screw through both boards. The dog sank its teeth into the delivery man's leg. (transitive, snooker, pool, billiards, golf) To pot; hit a ball into a pocket or hole. (heading, social) To diminish or be diminished. (intransitive, figuratively, of the human heart) To experience apprehension, disappointment, dread, or momentary depression. I tried, but I could not wake him. This caused me a great fear, and I looked around terrified. Then indeed, my heart sank within me. Beside the bed, as if he had stepped out of the mist, or rather as if the mist had turned into his figure, for it had entirely disappeared, stood a tall, thin man, all in black. Peter's heart sank. "Don't you think it is dreadful?" he asked. (transitive, figuratively) To cause to decline; to depress or degrade. Thy cruel and unnatural lust of power / Has sunk thy father more than all his years. (intransitive) To demean or lower oneself; to do something below one's status, standards, or morals. Who would sink so low as to steal change from veterans? (transitive, slang, archaic) To conceal and appropriate. If you are sent with ready money to buy anything at a shop, and happen at that time to be out of pocket, sink the money, and take up the goods on your master's account. (transitive, slang, archaic) To keep out of sight; to suppress; to ignore. (transitive, slang, archaic) To reduce or extinguish by payment. (intransitive) To be overwhelmed or depressed; to fail in strength. I think our country sinks beneath the yoke. (intransitive) To decrease in volume, as a river; to subside; to become diminished in volume or in apparent height. It was not far from the house; but the ground sank into a depression there, and the ridge of it behind shut out everything except just the roof of the tallest hayrick. As one sat on the sward behind the elm, with the back turned on the rick and nothing in front but the tall elms and the oaks in the other hedge, it was quite easy to fancy it the verge of the prairie with the backwoods close by. Use of sunk for the simple present instead of sank is not uncommon, but may be considered non-standard. Jones' has a two-seamer with heavy sink. 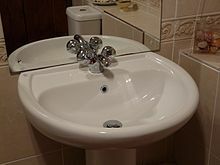 In plumbing, a sink or basin is a bowl-shaped fixture that is used for washing hands or small objects. Copyright © 2019 日本環境感染学会　All rights reserved.